Travelling to Mumbai to lead workshops for Songbound was my first trip to India. I have to admit that I was nervous before I arrived as it’s been a long time since I travelled alone; my normal work trips involve travelling as part of a group on concert tours. But the instant I was greeted with a huge hug by Nirmala (my chaperone) at the airport, my nerves were eased. I was immediately struck by the noise levels – the traffic, the huge volume of people chatting, the dogs barking. Mumbai makes city music 24 hours a day! 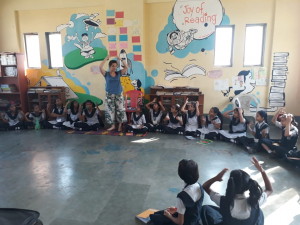 The first workshop at Jogeshwari was challenging and invigorating as both classes were combined for the first time and the children were really excited. But they had learnt all of the songs and sang with so much commitment and energy. I was bowled over by the sound of their voices. 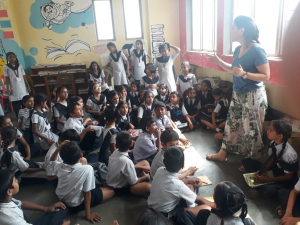 On our way out of the school, Avantika mentioned that I’d just had the most ‘difficult’ centre regarding discipline so I breathed a sigh of relief and was excited about the days to come. 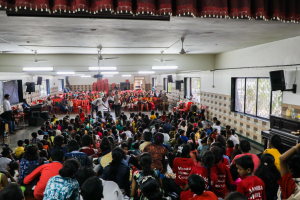 One of the most memorable days of my stay in Mumbai was the choir leaders’ training day. The first choir leaders I met that morning were Ashish and Pratibha. 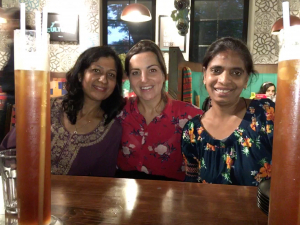 Ashish said ‘we’re the reason you’re here!’ which I found so moving as I recognised their faces as children from the Sound of Mumbai film I’d recorded the backing track for back in 2010. All of the choir leaders were so welcoming and fun to work with. Their singing was really strong and we worked on a song for them to perform at the concert without the children. The day whizzed by and there was a lot of silliness and laughter as well as concentrated sharing of ideas and songs. ‘Here Comes Sally’ was so popular that we gave an impromptu rendition at the end of the concert before we all said goodbye. 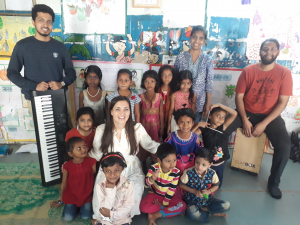 Prerana and Bhakti Park were two centres where I was particularly moved by the commitment and dedication of both the choir leaders and the children. The teaching environments were challenging and the children obviously relished the chance to escape into music for a couple of hours. I’ll never forget the audience of toddlers we had at Bhakti Park who sat silently for an hour listening to the older children rehearse their songs. And the children at Prerana helped me write some song lyrics for our ‘Power of Light’ song which they performed as a solo in the concert. The first few phrases the children sang as a 300-strong choir at the rehearsal on the day of the concert moved me to tears. They sing with such vigour and abandon and the sound is overwhelming. To harness all this energy and give these children a chance to express themselves was a privilege. Overall, I had the most rewarding experience of my career during my week in Mumbai. 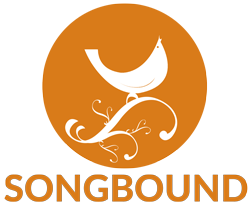 The enthusiasm of everyone involved in Songbound was infectious and I can’t wait to visit again – Gwen Martin, visiting practitioner, February 2019.